Jazeman Jaafar, one of Malaysia’s most successful young sportsmen, celebrated a dominant win at Rockingham Motor Speedway in Corby, UK at the fourth round of the British F3 International Series this weekend. 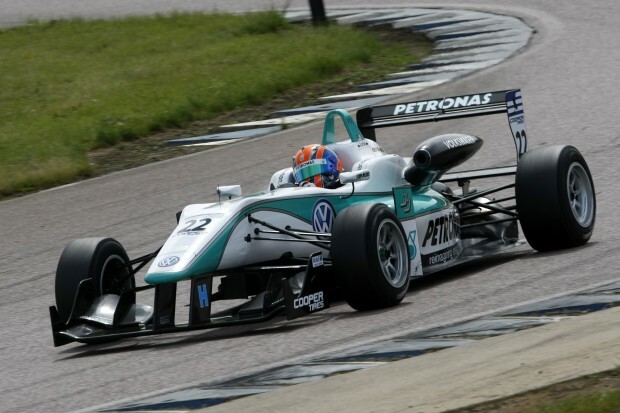 Backing up his victory in the first race with a sixth place finish in the second race and fourth position in the third, Jaafar leaves Rockingham leading the British F3 Drivers’ Championship. Friday’s practice sessions were held in cold, damp and windy conditions, bringing plenty of challenges to Jaafar as he prepared for the races ahead. The young Malaysian and his engineer worked through a programme of set up changes and readied for qualifying, running consistently within the top ten throughout the day. Saturday’s morning qualifying session was, as always, a frantic battle for clear track and putting together the best lap possible. With high winds adding to the challenge, Jaafar put his head down and focused on the task, posting lap times which put him in third place for both the first and third races. A storming start off the line for Jaafar in the first race catapulted him into the lead and the 19-year-old then put his foot down to put plenty of car lengths between his Volkswagen-powered Carlin Dallara and the pursuing pack. Keeping his cool for 22 laps, Jaafar led the field, building up a healthy 2.1 second gap to take the chequered flag and a fantastic victory, as well as posting fastest lap of the race. The second race, held on Sunday morning, saw Jaafar line up in eighth place on the grid. He had a clean start and was jostling with the pack through the first sequence of corners, emerging in seventh by the end of the opening lap. As the race settled down Jaafar started to close up on sixth placed driver, Nick McBride, and he then began to hunt down Hannes Van Asseldonk, but with only 15 laps the chequered flag fell and Jaafar scored more valuable points for his seventh place finish. The second corner on the opening lap produced plenty of action in the opening lap of the third race with Jaafar in the thick of it. As they crossed the line to start the second lap Jaafar was in fourth place with Van Asseldonk close behind him. The Malaysian driver had Carlin team mate and runner up to Jaafar in the championship points, Carlos Sainz Jr, in his sights for the final podium place and started to chase him down. Sainz Jr, just as hungry for points as Jaafar, kept his rival at bay and in a processional race, after 30 laps, Jaafar crossed the line in a strong fourth position, to leave Rockingham as the leader in the British F3 Drivers’ Championship. Jaafar has a rare weekend off from racing next week and will be back out on track in two weeks’ time at Brands Hatch, Kent, in the UK for the fifth round of the British F3 International Series.